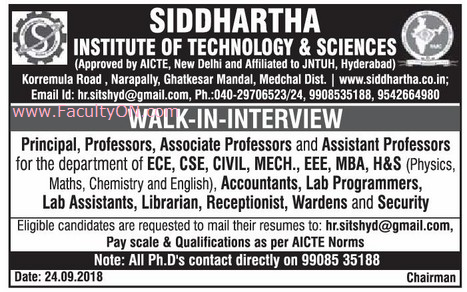 Siddhartha Institute of Technology and Science, Medchal has advertised in the EENADU newspaper for recruitment of Professor / Associate Professor / Assistant Professor / Principal Plus Non-Faculty jobs vacancies. Interested and eligible job aspirants are requested to apply as soon as possible from 25th September 2018. Check out further more details below. About College: Siddhartha Institute of Technology and Sciences (SITS) was established in the year 2008 and is affiliated to Jawaharlal Nehru Technological University-Hyderabad (JNTUH), Hyderabad. The Vision and Mission of the college are directed to create knowledge and to open the minds of the students to the knowledge that empowers them to utilize their quality educational opportunities to the best possible extent.. The teaching-learning process is carried –out through the use of Over Head Projects (OHP) and LCD projectors. SITS’s excellent facilities include an extensive computer centre, library, advanced lab for communication skills, internet centre and spacious seminar halls and Electronic classrooms.